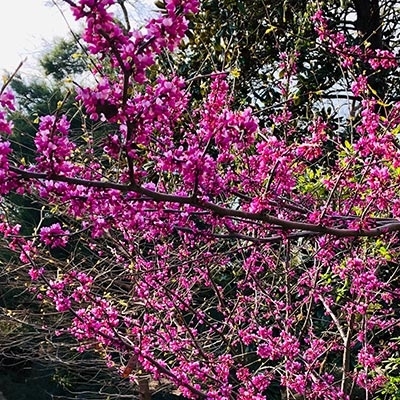 March has faded into April with the cold weather stuttering into warmer breezes and longer days, and the crisp mornings are becoming fewer and farther between, but that doesn’t mean that the spring blooms are gone. Far from it, in fact. 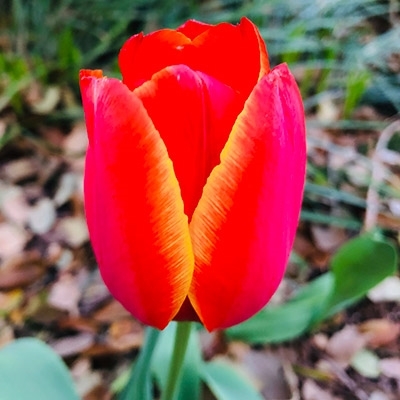 Large swaths of tulips adorn beds everywhere one looks, and another round of daffodils are emerging from their bulbs to brighten our walkways and our moods, and the Redbuds are in full bloom! To celebrate, you should join us this coming Saturday from 10:00 am to 3:00 pm for our annual Spring Fling. Help us celebrate spring by shopping from talented artists and artisans while being serenaded by musicians. And if you get hungry, fear not! Food trucks will be available for concessions in the parking lot. You won’t want to miss this! Admission is only a dollar per person. Additionally, the response for our event with the Cliburn has been phenomenal! All tickets are reserved. If you haven’t picked them up yet, please call us to confirm door pick-up. If you missed out on this one, no worries! We hope to schedule more educational and entertaining events in the near future. Tell your friends and family, and “like” us on Facebook too, to ensure you stay abreast of the news and events! We hope each and every one of you has the happiest of springs, and that we see you soon! Join us at the Gardens as we welcome spring!! This year promises to be our best Spring Fling yet! 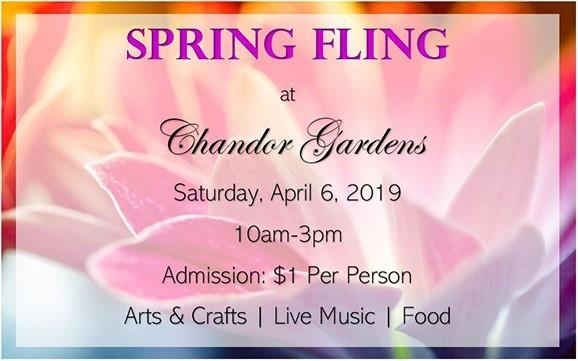 With over 50 fabulous vendors, music, food and the beautiful blooming gardens to wander in, where else would you want to be on a Saturday in April? Our list of participating vendors has topped 50 this year! JJ the Clown will entertain the youngsters with Balloon Art and Face Painting. Our special friends from The Parker County Master Gardeners will be on hand with their popular "Ask a Master Gardener" booth for your horticulture questions. In the event of inclement weather the Spring Fling will be cancelled. Check with us on Facebook for the latest updates. Instructor Loretta Benham offers yoga classes on Tuesdays and Thursdays at Chandor Gardens. Loretta's mix of energetic sequences incorporated with stillness through breath work and meditation to quiet the mind will provide a healthy addition to any workout regimen. Bring your mat and wear comfortable clothing. In inclement weather, classes will be held in the Great Room. For more information call 817-597-1503 or 817-613-1700. Even in the shadier areas of the garden, there are blooms everywhere. One of the small upsides to last year’s ice storm is that it created areas with sun where there wasn’t much before, and our staff and the Master Gardeners have made full use of that opportunity. It’s spring, let’s celebrate it! You just never know what wildlife you might happen upon in the gardens. 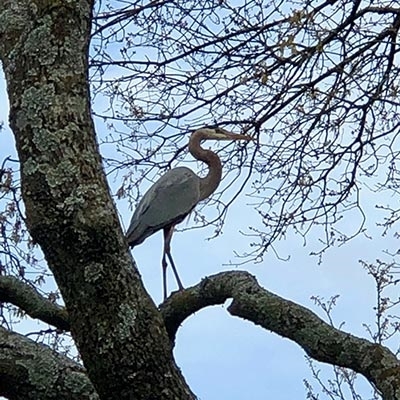 Check out this Gray Heron taking a break from its migratory travels in one of our large trees. This large, prehistoric-looking bird is a predatory wading bird that is endemic to most of the temperate world and travels south for the winter months. He’s a cool looking bird. There are always plenty of opportunities for bird watchers in the gardens, so come on out and see which feathered friend is visiting today! 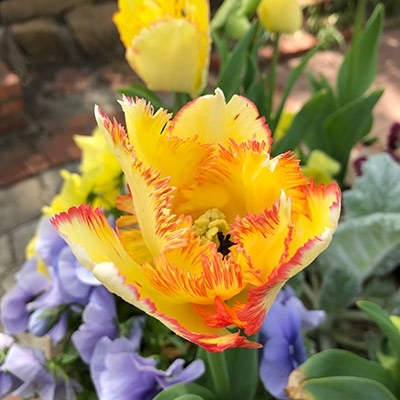 How perfect is this frilly Tulip? These were planted by the Parker County Master Gardeners who, each spring without fail, plant thousands of bulbs throughout the garden. Everywhere you look, they are in bloom in a wide array of colors and sizes. Some are small and diminutive while others are larger than your fist. They also make an excellent backdrop for spring photos, so call us to schedule your photo session in the gardens today at 817-613-1700! 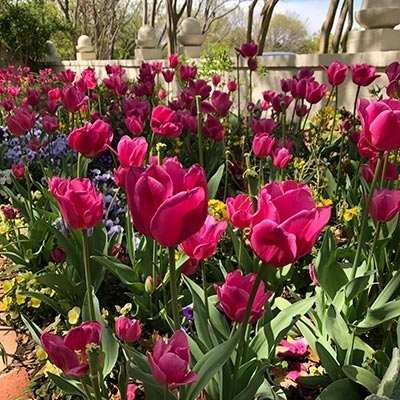 Gorgeous magenta Tulips tower over golden and lavender Violas in the old Herb Garden near the Grape Gates. This spot can be easily overlooked, but it truly is a bright patch of sunshine and blooms. But hurry, the Tulips in particular are nearing the end of their blooming season. 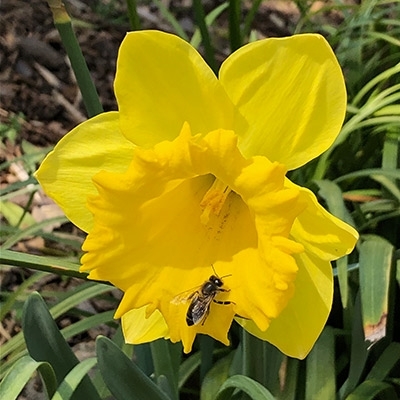 An early-emerging bee is seen here pollinating these adorable daffodils for an early spring snack. Bees are such an important part in virtually every ecosystem, so seeing them in action is such a treat. Without them, we would be in dire straights. If you’re interested in planting bee-friendly blooms, it’s as simple as planting butterfly-friendly plants! Bee balm, milkweed, lavender, and salvia are all great things to plant in a garden, particularly the milkweed. This year will also be one of the biggest years for butterflies in decades, so maybe plant a couple, or at the very least, use it as a good excuse to leave those dandelions on the lawn a little longer. The bees and butterflies will thank you for it and reward you with flowers and crops for years to come. Dates are filling up fast for 2019 & 2020. Take the Gardens home with you. 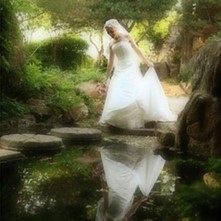 There are postcards, note cards, prints, and t-shirts sporting fabulous images of Chandor Gardens in our gift shop. We feature unique handmade items by a variety of local artisans specializing in textiles, stained and fused glass, jewelry, painting, photography and much more. These beautiful and native trees are a stunner in any garden, which is why we have many planted throughout ours! They are in full bloom right now and raise the eye up to new heights with their color and vibrancy. There aren’t many trees that bloom with such a bright flower, so how lucky are we that this species not only comes in a variety of cultivars, but is also native to our landscape? 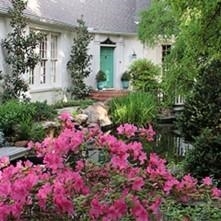 The trick to making sure that flowers have the highest impact in a garden depends on several factors. Different colors, heights, and textures are important to pack the biggest punch in a garden, and our staff nailed it here. 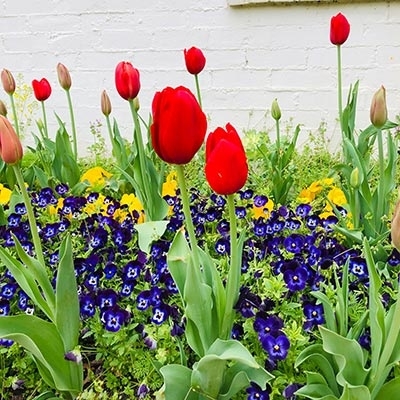 Here we see red Tulips, yellow and purple Violas, and the delicate sprays of the Brassica plants in bloom in the back, all with a backdrop of crisp, vintage brickwork. If you wait long enough, it is inevitable to see bees and butterflies flirting along, and an anole lizard or two waking from it’s winter nap. 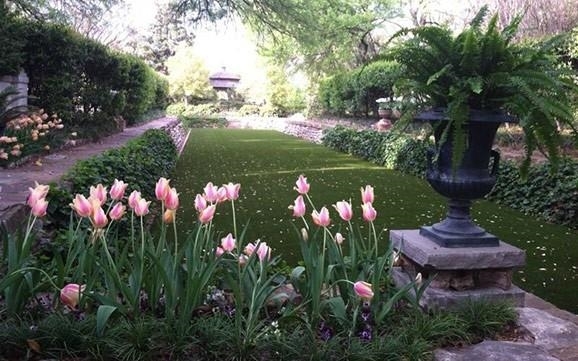 Come see us soon while the bulbs are in bloom, because Texas springs don’t last long! Click here to subscribe to our FREE email newsletter, Secrets from the Garden.